Sterling Children's Books, 9781454908791, 32pp. 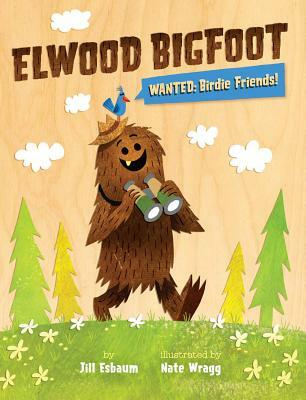 Elwood Bigfoot is big, clumsy, LOUD . . . and lonely. It's hard for him to make friends--especially with the tiny, delicate birdies he loves so much. Each flash of their feathers, each chirp and cheerful song helps him feel less alone. But whenever a birdie swoops by, and Elwood hollers at it to STAY, the scared creature flies away. He tries everything: sitting on a branch, having a housewarming party, even building an amusement park with snacks and pools. But nothing helps--until Elwood finally learns how to make his bird dreams come true. One of the Globe & Mail's 100 Best Books of the Year. Jill Esbaum is the award-winning author of many picture books, including I Am Cow, Hear Me Moo! and I Hatched! (both Penguin). She also enjoys writing a variety of nonfiction books for National Geographic Kids, including the popular Angry Birds Playground series. Jill lives on a farm in Iowa. Learn more at jillesbaum.com and picturebookbuilders.com. Nate Wragg is an art director, illustrator, and Bigfoot enthusiast. Some of the books he's illustrated include Too Many Cooks, by Margaret McNamara (Disney), Goldi Rocks, by Corey Rosen Schwartz and Beth Coulton (Penguin), and At The Old Haunted House, by Helen Ketteman (Amazon). He lives in Southern California with his family.